1 his flightless, forest-dwelling bird is nocturnal, biding by day in a burrow or cavity and feeding at night. Its eyesight is poor, but it has a good sense of smell, and its nostrils are placed at the tip of the bill. Sensory bristles at the base of the bill also help locate food. The Kiwi probes the soil for worms and other invertebrates, also eating some seeds and berries. It can run fast but is always unobtrusive. The call is a high, whistling sound. The female lays one or two large eggs, each about one-fifth of her body weight. 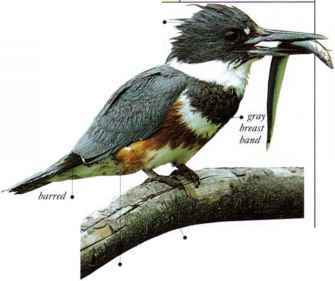 The male incubates these, hatching out the feathered, active young. • NliST A bare hollow in a burrow in the ground, in a hole among tree roots, or in a hollow log. • Distribution Thinly distributed in New Zealand. 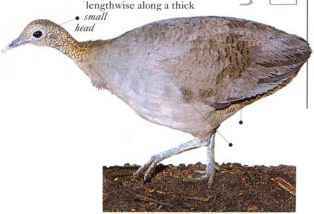 Characterized by a thin neck, small head, lumpy body, and thick legs, this tinamou is a forest-dwelling bird. It is not very agile and is only a weak flier. When threatened, its most likely response is to creep away quietly or to crouch in hiding and fly off only at the last moment if discovered. It roosts in trees and does not perch easily but positions itself lengthwise along a thick branch, squatting down on the lowc part of its legs. The legs are equipped with special rough, projecting scales that help the bird stay in place. The Solitary 'Tinamou feeds on the ground, taking fallen fruit and seeds, and occasional insects. It is sometimes seen bathing in shallow forest pools. The males incubate the eggs, sometimes covering them with dead leaves if they have to leave the nest to feed. Males also tend the young until they become independent. • NRST A hollow on the forest floor, made by the birds and thinly lined with grass and plant stems. • Distribution e. Brazil, distribution s.e. Paraguay, and n. Argentina. 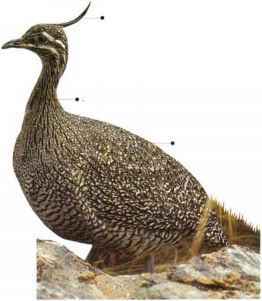 The slender, upward-curving crest helps identify this tinamou, which is adapted to living in open country, dry grassland, scrub, and woodland. It is capable of running fairly fast across open ground, but if alarmed it is more likely to crouch and hide, waiting until danger is past. If approached directly it makes a short, low flight on whirring wings as a last resort. 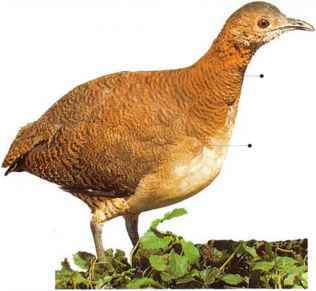 At times the Elegant Tinamou is a solitary-living species, but after the breeding season it is seen in family parties, and these sometimes combine to form small flocks. The male incubates the eggs. The young arc downcovered and can run and feed within minutes of hatching. They soon leave the nest, under the supervision of the male. The diet consists of seeds, fruit, and other parts of plants, as well as insects. • NEST A hollow in the ground, made by the birds, often situated close to a low bush. • DISTRIBUTION Much of Argentina; also scattered, small populations in E. Chile.